In a recent Hawai‘i Business Roundtable speech, Gov. 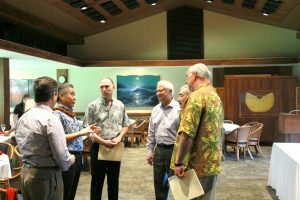 David Ige talked with CEOs from some of the state’s biggest companies about working together to create a strong innovation economy as the next best hope for future jobs. What is an “innovation economy” and why is that important? Beyond tourism and the military, an innovation economy offers the best promise of high-quality, living wage jobs for our kids and others in this digital age. It can reach every sector of our community — from new agriculture apps to help farmers to locally created digital media, film and cultural content, clean energy, biotechnology, and cybersecurity. This new way of doing business doesn’t require substantial land or a large carbon footprint. With the right broadband capacity to reach any part of the globe, knowledge workers can live anywhere. We want to create a place where the best and the brightest — especially our own local talent — can call Hawai‘i home. What are some key pieces of this plan already in place? The state’s Department of Business, Economic Development and Tourism and the University of Hawai‘i have joined forces with the business community to encourage entrepreneurial development, research commercialization, and investment support from public and private partners. This legislative session, we are seeking funds to build on the success of DBEDT’s HI Growth Initiative and UH’s XLR8UH, for startup business development. What is the outlook for the future? We know the future looks bright. A 2015 report ranked Hawai‘i 12th in the nation for startup growth — above California and just below New York. Several local accelerators have been recognized as among the best in the nation. We’re also developing an Entrepreneur’s Sandbox in Kaka‘ako and a broadband initiative, thanks to $25 million from the 2015 state Legislature.